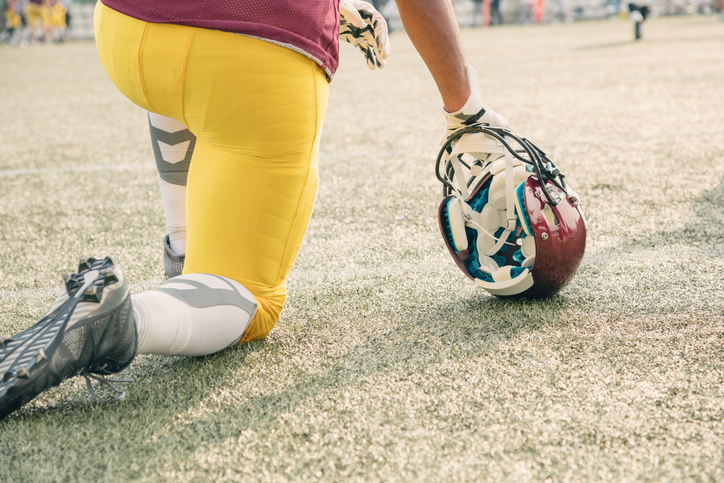 In the 2016-2017 and 2017-2018 National Football League season, dozens of NFL players knelt at games while the national anthem played during pre-game ceremonies. Many of these players were spurred to action by Colin Kaepernick's initial decision, while he played for the San Francisco 49ers, to first sit and then kneel during the national anthem, in order to protest police brutality. The players’ protests sparked hostile responses from some quarters, led by President Trump, who declared that players who protested should be fired and expelled from the U.S.. This new policy appears to have a loophole large enough to drive an 18-wheeler through it. At the very least, it invites artful protests in response, and even during the pre-game playing of the anthem. Set aside for the moment the significant legal questions whether this new NFL policy runs afoul of state constitutions’ guarantees of free speech, whether Trump’s insistence on the NFL’s adopting this policy is the unconstitutional use of state power to coerce private entities to suppress protected speech, and whether public ownership of several stadia in which NFL teams play triggers application of forum analysis and the sliding scale of First Amendment protection afforded to speakers in different kinds of fora, which might include both fans and NFL players. Thence, focus on the plain facial ambiguity of the key language of the NFL policy: “...team and league personnel on the field shall stand and show respect for the flag and the anthem.” (Emphasis added.) This language seems easily to accommodate imaginative on-field protests, rather than to deter them. A range of hypotheticals readily presents itself if players elect to stay on the field and stand for the anthem. Right hands on their hearts, they could hold placards showing a picture of the U.S. flag, with the words “Respect the Flag and Anthem” printed above the flag and “Black Lives Matter” or “#BlackLivesMatter” printed below the flag. They could stand during the anthem, hand on heart, holding a placard that shows the flag and has the legend “Respect the Flag and Anthem,” above the face of a victim of police violence with the victim’s name and date of death printed below the face. Endless variations on these expressive examples would appear to comply with the letter of the NFL policy and 36 U.S. Code § 301. How exactly would the NFL argue that players who engage in these kinds of silent expression are violating the new NFL policy? And, on what basis would the league impose fines on teams whose players elected to express themselves silently while standing at attention, hand on heart, during the anthem and pre-game display of the flag?